Nothing says I hate my life like shopping for holiday gifts at the last minute, with a child in tow. I know, I've done it. Last year, I vowed NEVER again. I was sick of standing in a line that snakes all the way to the back of the store just so I can to buy overpriced crap because I'm in a last-minute pinch. So I made a plan. A really good plan. This is year two, and I've finished most of my holiday shopping, with my sanity intact. 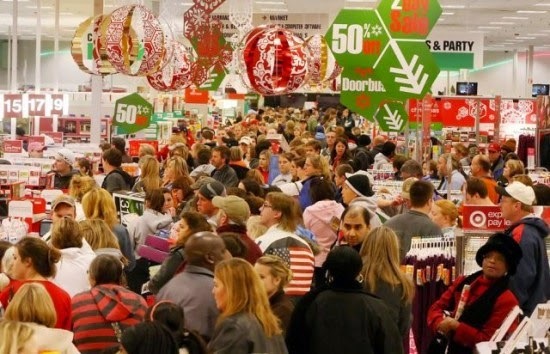 Here are 10 Tips To Save Big AND Avoid Having A Holiday Shopping Meltdown. I WILL NOT PAY FULL PRICE THIS HOLIDAY SEASON! 1. Make A List. Probably the biggest holiday shopping mistake is going shopping without a solid plan. Going to the shops with a loose list of people to shop for, and a vague idea of what I want to get them is dangerous on so many levels. From over buying to completely forgetting Aunt Thelma... Everyone's been naughty, just make the damn list already! Make a list of anyone and everyone you may want/need to buy gifts for, then add your vague gift ideas. Maybe even go so far as to just come out and ask them what they want. Then use this as your master list. Stick to it, and when that person has been taken care of, write down what you got them, and cross them off the list. Organization is key. 1. My holiday shopping time and budget are limited. 2. The post-holiday clearance sales in January are WAY BETTER. It's best to leave yourself out of the equation until after the holidays. 3. Leave the distractions at home. When possible, avoid taking your child(ren) with you. Even if this means trading all of your lunch breaks until January. Brown bag it and shop in peace. Kids only complicate the mission with their begging, meltdowns and diaper blowouts. 4. Price shop from home. There are way too many apps and websites available today to not to compare prices both online and in stores. Take Your Master List and price shop online before you step foot in an actual store. Write down where the best deal is, then check your list once finished for stores or websites that overlap. This can save you a bundle on shipping and time. Between the coupon apps and the compare-and-save apps, there is no reason to pay full price anymore in store or online. Example: I needed a big ticket item from a big box hardware store. I went to their website, found what I wanted, then searched for a coupon code. I was able to save 20% at checkout with a coupon code I found on Ebates. What made the deal even sweeter was that I opted for an in-store pickup. This saved me time and money. DO THIS!!! 6. Coupon like a crazy person. Coupons are everywhere these days, don't buy without them! Don't just rely on coupon specific websites and apps, check the website for the store you are heading to. So many stores will scan the coupons off your phone. If you shop at Target and don't use the Cartwheel app... bad, bad, bad. TIP: GiftCardGranny is a totally legit site to get gift cards at super discounted prices. So before you buy a gift card in a store, check Gift Card Granny first. 8. Shop Secondhand. What does every parent have in common at 2 am on Christmas Eve/Hanukkah? They're putting together toys. So, if you are going to give your child a fully assembled toy anyway, why not just buy it secondhand, shine it up and slap a bow on it? Secondhand children's stores and higher end consignment shops have incredible deals on gently used items... so worth checking out! 10. Regift it! Before you do any of the things on this list, grab a box and walk around your house filling it with crap you don't want anymore. Remember, your crap is another person's treasure. Somehow. Once you have filled the box, sit down and decide which friend/family member or what holiday party's Secret Santa you can pawn your crap gift the goods to. How do you save big during the holidays? If you have any tips or tricks, please please please share them!!! !